"The challenge, then, is not to invent new victims or new scapegoats but to mobilize America for the future. What would it take to ensure that all of us can succeed at getting the job done, the problem solved, and the future more secure?" As a student at Yale Law School in 1974, Lani Guinier attended a class with a white male professor who addressed all the students, male and female, as "gentlemen." To him the greeting was a form of honorific, evoking the values of traditional legal education. To her it was profoundly alienating. Years later Guinier began a study of female law students with her colleagues, Michelle Fine and Jane Balin, to try to understand the frustrations of women law students in male-dominated schools. Women are now entering law schools in large numbers, but too often many still do not feel welcome. As one says, "I used to be very driven, competitive. Then I started to realize that all my effort was getting me nowhere. I just stopped caring. I am scarred forever." 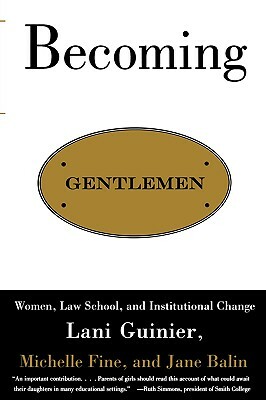 In Becoming Gentlemen Guinier, Fine, and Balin dare us to question what it means to become qualified, what a fair goal in education might be, and what we can learn from the experience of women law students about teaching and evaluating students in general. Including the authors' original study and two essays and a personal afterword by Lani Guinier, the book challenges us to work toward a more just society, based on ideals of cooperation, the resources of diversity, and the values of teamwork. Lani Guinier is professor of law at the University of Pennsylvania Law School; Michelle Fine is professor of social psychology at the Graduate School and University Center, City University of New York; and Jane Balin is assistant professor of sociology at Colgate University.